The information on this page pertains to attorneys practicing in the Northern District of Florida. 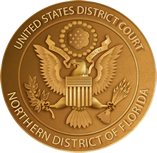 Attorneys who wish to file a case in the Northern District of Florida must first obtain a PACER login and be admitted to the Northern District of Florida Bar so they can file documents with the Court electronically. Please note that electronic filing of documents is mandatory in the Northern District of Florida. For more information on filing documents electronically through CM/ECF, visit the E-filing (CM/ECF) Info page, or review the list of frequently asked questions about CM/ECF. Links to important resources, such as the local rules of this court, the schedule of filing fees, and frequently used forms can be found in the general info section, below. Attorneys appointed under the Criminal Justice Act should visit the CJA Info page for information on CJA eVoucher. Attorneys seeking admission to the Northern District of Florida Bar should complete the following steps. Register for attorney admission through PACER, using an upgraded PACER account. From the PACER homepage, select Manage My Account at the top of the page > Log in > select the Maintenance tab > click the link that says Attorney Admissions/E-file Registration. Complete the Attorney Admissions and Efile registration request. Once you submit your registration request, it will go to the Attorney Admissions Clerk for processing. After the clerk verifies your completion of the Attorney Admission Tutorial and your Florida Bar status, you will receive an email with instructions to pay the admission fee electronically using the Northern District of Florida’s Bar Admission link. Our court does not collect the admission fee via PACER. After paying the attorney admission fee, you must reply to the email and notify the clerk that your fee has been paid. When the "fee paid" email is received, the clerk will enable your e-filing privileges and email you an electronic certificate of admission. If you have questions about the attorney admission process, please submit your question using the attorney admission question form. Attorneys seeking pro hac vice admission to the Northern District of Florida should complete the following steps. Local counsel is not required; it is preferred that you do NOT use local counsel. From the PACER homepage, select Manage My Account at the top of the page > Log in > select the Maintenance tab > click the link that says Attorney Admissions/E-file Registration. Complete the Pro Hac Vice registration request. After the clerk verifies your completion of the Attorney Admission Tutorial and verifies you are in good standing with the bar of the jurisdiction where you reside or regularly practice law, you will receive an email with instructions to e-file your Motion to Appear Pro Hac Vice. The pro hac vice fee is collected at the time of filing Motion to Appear Pro Hac Vice. If you need to initiate a new case, e-file the complaint, first, and then e-file your Motion to Appear Pro Hac Vice.